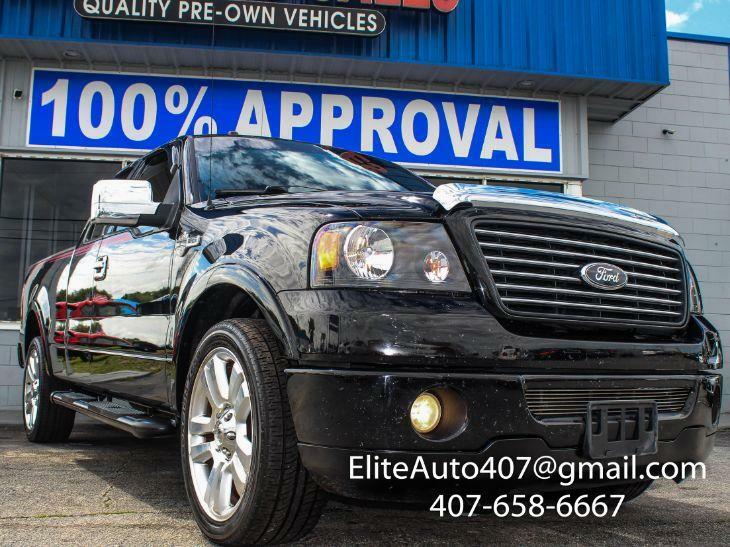 Dare to turn heads with our 2006 Ford F-150 Harley-Davidson SuperCab 4X2 shown off in Black. Powered by a 5.4 Liter V8 that offers 300hp while connected to an Automatic transmission. This Rear Wheel Drive looks bold and commanding and is accented perfectly with prominent wheels, chrome accents, a bed liner, and running boards, plus offers near 19mpg Inside, the leather-trimmed front bucket seats in our Harley-Davidson include power adjustments and you'll also appreciate full power accessories and a sunroof. Full-color navigation is here to guide your way to all the places you're heading in this superb truck! Check out the pictures, and you will see that the team at Ford has outdone itself for you. You will love the 4.2 inch LCD Productivity Screen as it provides fuel economy, towing information and off-road data with the glance of your eye. This Harley-Davidson F-150 SuperCrew Truck comes with a fully boxed frame and tire pressure monitoring system plus ABS, a backup camera, and airbags. Print this page and call us Now... We Know You Will Enjoy Your Test Drive Towards Ownership!